Android Pay and Apple Pay are greater threats to Visa than Visa is to PYPL; indeed, Android Pay for mobile browser is Visa Checkout without the Visa brand. This wrapping of the Visa brand by the two OS-based schemes will intensify as, having validated NFC-enabled payment solutions, they increasingly support integration with third-party apps to lift consumer value and adoption; last month, for example, Android Pay announced support for integration first with NFC-enabled merchant loyalty programs (to drive consumer value and merchant adoption) and into mobile banking apps (to drive distribution). We expect Apple Pay to follow suit this month, and it may even provide a hardware API for the NFC controller so that app-providers can implement own-brand mobile payments solutions on iOS devices independently of Apple Pay, just as Wells Fargo Wallet implements mobile payments on Android devices independently of Android Pay. For now, Android Pay and Apple Pay provide security through network-based tokens but, as payments begin to flow through their operating systems, Apple and Google will have pricing power over the networks and the ability to substitute other security solutions including bank-provided tokens. Already, both OS-providers have proprietary fraud-detection tools and the large banks are also investing in payments-security both individually and through the integration of Early Warning Systems into clearXchange. Over time, we expect the large banks to offer their own token services in competition with the network brands as described in our report of May 30th titled “V, MA – From NSPs to TSPs”. What then of PYPL? Surely, consumer adoption of Android and Apple Pay represents a competitive threat to a branded buy-button as much for PYPL as for Visa. It does, but our PYPL thesis is that the dominant impact of Apple/Android Pay will be to drive merchant support for tap-and-pay including activation of NFC terminals at point-of-sale (expected to reach >two-thirds of all terminals by 2020) and consequently demand for gateways (providing connectivity between these terminals and acquiring processors). Through Braintree, PYPL is a market-leader in gateways and the demand for its unbranded services will create opportunity to pitch the branded buy-button. CEO Don Schulman clarified the “full vertical stack” strategy in June: “it’s an unbranded platform powering the [merchant] app … we have 170mm consumers around the world to seamlessly sign up … and light up the app for the merchant”. Or, more succinctly: “if you build it [a mobile payments solution], it does not mean they will come.”. Since Apple Pay was launched in October 2014, it has become clear that, beyond the initial novelty, the feature is not driving enough perceived value to retain consumer interest. While 23% of consumers with TouchID-enabled devices have tried Apple Pay, eligible usage (defined as the number of transactions effected with Apple Pay as a proportion of those that could be effected with Apple Pay) showed a year-on-year decline of 41% in 2016Q1 to ~3%. Survey-provider InfoScount commented on the results from last Black Friday that “it was actually PayPal that came out on top”. A key reason for low adoption rates is lack of ubiquity. Consumers are not sure where they can and cannot use NFC-enabled payments and this is reflected in the fact that a leading reason, cited by ~one-fifth of consumers, for not repeat-using Apple Pay is “forgot”; however, this is less than the ~one-third from last year and will continue to become less important as retailers more uniformly activate NFC-enabled terminals (expected to reach >two-thirds of all terminals by 2020) at point-of-sale. The more durable obstacle to adoption is that consumers are simply not getting enough value relative to alternative tender forms with ~one-third of consumers indicating either that they preferred cash or did not want to use Apple Pay; the proportion of these unimpressed consumers is rising. The Federal Reserve survey of “Consumers and Mobile Financial Services” published in March confirms that “the main factors limiting consumer adoption of mobile banking and payments were a preference for using other methods” but adds “in terms of the value proposition to consumers, the significant number of mobile users who reported an interest in using their phones to receive discounts, coupons, and promotions or to track rewards and loyalty points suggests that tying these services to a mobile payment service may increase the attractiveness of mobile phones as a means of payment”. Our thesis is that by providing support for instant enrolment in merchant loyalty programs and for transactions from within mobile banks apps including the Bank of America app, both at point-of-sale and at ATMs, Android Pay and Apple Pay will begin to drive mass consumer adoption. The integration of NFC-enabled loyalty programs into NFC-enabled payments is likely a key driver of payments-adoption and, indeed, is already possible. iOS9, launched in September 2015, allowed consumers to load loyalty cards into Apple Wallet along with network-branded payments cards with Walgreens announcing its support of the NFC-enabled integration of its loyalty program, Balance Rewards, into Apple Pay the following month; previously, consumers could trigger split-tender transactions with a scan of a Balance Rewards card separately from the payment tap whereas now, with enabled terminals, there is one tap to apply loyalty points to a purchase and a second tap to complete the transaction through payment from a primary funding account. And Android Pay, which has long supported integration with My Coke Rewards that can then be redeemed at vending machines, announced last month an extension of support for loyalty programs to retailers with Walgreen being an early adopter and excited by Android Pay support for instant loyalty enrolment through the save-to-android-pay API. NFC-Enabled Loyalty Cards: Merchants are seeking greater penetration of loyalty programs to build engagement with, and access the personally-identifying-information of, consumers. The support for “instant loyalty enrolment” provided by the “save-to-android-pay” API, allowing consumers to save a loyalty card to Android Pay, aligns with this retailer objective and generates an important value proposition to consumers through integrating NFC-enabled loyalty redemption into an NFC-enabled payment; for consumers, this integration allows split-tender tap-and-pay-and-save transactions, involving both loyalty points and a primary bank funding account, as well as tap-and-pay. Integration with Bank Apps: Banks are seeking additional drivers for consumer engagement in own-brand mobile banking apps beyond balance-check and remote-deposit-capture, and payments is a natural candidate. While WFC and JPM have built proprietary solutions, both they and other banks can leverage the security solution (based for now on tokens from the branded-networks) and integration with NFC-enabled loyalty cards of Android/Apple Pay through integration into own-brand apps. 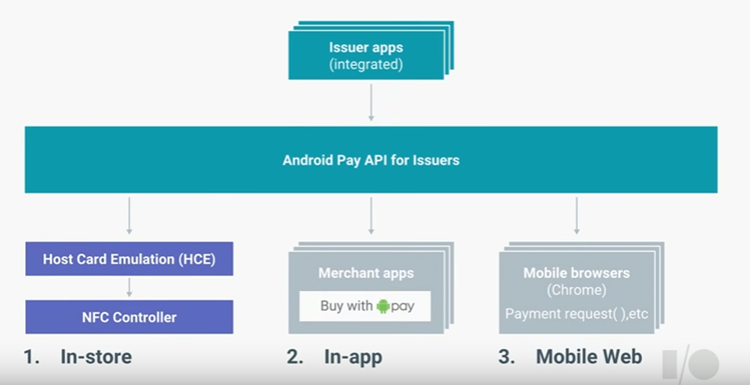 The API support for this integration announced by Google (see Chart) will allow consumers to register bankcard credentials to Android Pay from the natural context of a mobile banking app, and these credentials can then be used by Android Pay independently of the bank app; we expect Apple Pay to follow suit. Digital payments represent a nascent, rather than mature, market (with PYPL’s revenues of ~$10bn representing ~1% of the company’s estimate for TAM) so that building primary tends to demand drives results more than shifts in market share. Apple Pay and Android Pay, as well as new entrants such as Square, will build primary demand by habituating both consumers and merchants more around use of mobile payments including, on the merchant side, adoption of NFC-enabled terminals and NFC-enabled loyalty nad couponing programs. In particular, Apple Pay and Android Pay will drive demand for PYPL’s unbranded services, including gateway services, generating opportunity for the firm to pitch the branded buy button. Ease of developer use is a competitive edge for PYPL’s Braintree as Google noted in announcing improved merchant-support for Android Pay: “if you are an integrator with Braintree or Stripe literally less than 10 lines of code you can drop it into your Android app and enable Android Pay for your users”. And PYPL CEO Don Schulman clarifies the value-proposition of a full vertical stack including the buy button: “it’s an unbranded platform powering the [merchant] app … we have 170mm consumers around the world to seamlessly sign up [if the buy-button is adopted] … and light up the app for the merchant”.